My father, while visiting me in Delhi, suddenly decided that he needed to visit the Nizamuddin dargah, that too on a Friday. Not that my father is a very religious person but I guess if he had to fill in his Orkut/Facebook profile he’d put in something like “spiritual but not religious”. Now the problem with these places is the bloody crowd. For some reason, God and the people who get you to Him are an awfully popular lot and so it was with thedargah too. The only saving grace was that since we were visiting the place at the time of the Jumma Namaz, a large number of people had at least had a bath. The same can hardly be said of, say, a bus or a railway reservation counter. 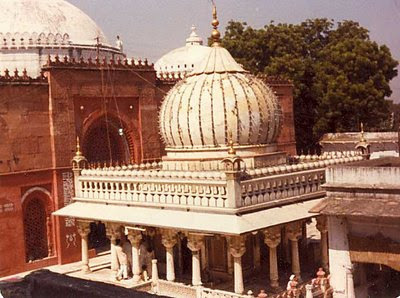 The area around the dargah itself was a typical Muslim mohallah of the type seen in Central Calcutta. Narrow dingy lanes with a profusion of small hotals selling extremely delicious food—Qormas, Qalias, Niharis, kheeri—as long as you don’t mind that from time to time, the man roasting your kawab, scratches his kawab through the folds of his lungi. In the background is Ghalib’s tomb which, as far as I could see, had no visitors. For those unable to read Devanagri: The two posters are wishing people for Eid. The one on the left belongs to the BJP, while the other belongs to the BSP. Getting to the dargah meant passing through a number of narrow galis selling all manners of knick-knacks. There were wall hangings with the first Qalma, key chains with the number 786, Urdu books on Shahrukh Khan and quite a few shops selling, what they called, “Islamic VCDs and cassettes”—as if just having a dargah wasn’t enough to make Abd al-Wahhab turn in his grave. The entrance had, what has become a Delhi staple—a metal detector. The detector was defunct, though—a clear sign of the Delhi Police’s faith in the saint. After all if the saint can’t protect his own tomb, what good is he? Born to a father named Daniyal in 1238, Nizamuddin Auliya was obviously destined for greatness. Moving to Delhi at the age of five from his birthplace in UP, he performed wondrous miracles which elevated him from the status of a mere mortal to a celebrated saint—cursing the city of Tughlaqabad to ruin, predicting the death of emperor Ghiyas-ud-Din Tughluq and even having a gay partner in Amir Khusrau, the royal poet of the Delhi Sultanate. In fact, the complex also houses Khursrau’s grave which wears a rather deserted look. The only two people there were a couple of bored teenage boys, dressed in spotless kurta-pajamas, discussing the upcoming India-Australia series. Auliya’s tomb, serviced by no less that two split ACs, was , on the other hand, was bustling with people lining up to offer a chadar to the saint, shepherded by a man who kept on shouting “beware of pick-pockets”. The saint is obviously a lot more effective against bombers. Note: The first picture is from Wikipedia. The rest have been taken by me. Love the captions on the pics man!